This is a really nifty new toy! 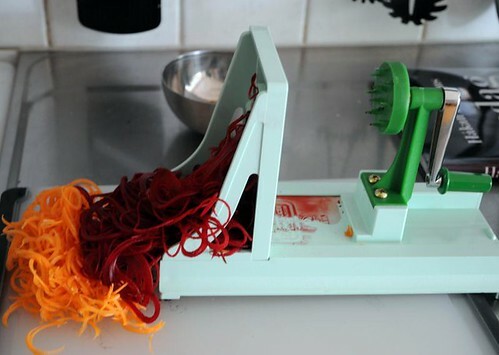 I used it to make shoestring potatoes, and I recently used it to make long carrot and beetroot "spaghetti". It's made by Benriner, and I bought mine on Ebay. Have wanted one of these for a few years now. They are not easy to locate. Would you recommend one now that you have used it or would you get another type of spiral slicer? The photo looks like what I would like. Thanks for sharing. Hi Fran! Well, this is the only spiral slicer I've tried, but it seems very good. It's sturdy and easy to use, and easy to clean as well. So yes, I definitely recommend it! I admit it's not exactly a multi-tasker, but it's good at what it does. LOVE these things. We have one, but it's the Benriner slicer, rather than the one you have which turns & slices. Still: they're fabulous!